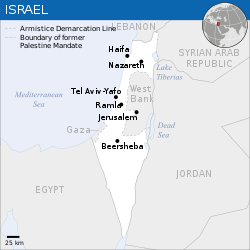 Israel (/ˈɪzriəl, ˈɪzreɪəl/; Hebrew: יִשְׂרָאֵל‬; Arabic: إِسْرَائِيل‎), officially the State of Israel, is a country in Western Asia, located on the southeastern shore of the Mediterranean Sea and the northern shore of the Red Sea. It has land borders with Lebanon to the north, Syria to the northeast, Jordan on the east, the Palestinian territories of the West Bank and Gaza Strip to the east and west, respectively, and Egypt to the southwest. 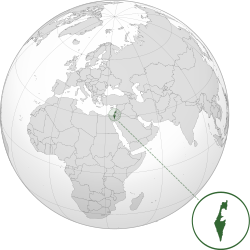 The country contains geographically diverse features within its relatively small area.Israel's economic and technological center is Tel Aviv, while its seat of government and proclaimed capital is Jerusalem, although the state's sovereignty over Jerusalem has only partial recognition. Israel has evidence of the earliest migration of hominids out of Africa.Canaanite tribes are archaeologically attested since the Middle Bronze Age, while the Kingdoms of Israel and Judah emerged during the Iron Age. The Neo-Assyrian Empire destroyed Israel around 720 BCE.Judah was later conquered by the Babylonian, Persian and Hellenistic empires and had existed as Jewish autonomous provinces. The successful Maccabean Revolt led to an independent Hasmonean kingdom by 110 BCE, which in 63 BCE however became a client state of the Roman Republic that subsequently installed the Herodian dynasty in 37 BCE, and in 6 CE created the Roman province of Judea. Judea lasted as a Roman province until the failed Jewish revolts resulted in widespread destruction, expulsion of Jewish population and the renaming of the region from Iudaea to Syria Palaestina.Jewish presence in the region has persisted to a certain extent over the centuries. In the 7th century CE, the Levant was taken from the Byzantine Empire by the Arabs and remained in Muslim control until the First Crusade of 1099, followed by the Ayyubid conquest of 1187. The Mamluk Sultanate of Egypt extended its control over the Levant in the 13th century until its defeat by the Ottoman Empire in 1517. During the 19th century, national awakening among Jews led to the establishment of the Zionist movement in the diaspora followed by waves of immigration to Ottoman Syria and later British Mandate Palestine. In 1947, the United Nations (UN) adopted a Partition Plan for Palestine recommending the creation of independent Arab and Jewish states and an internationalized Jerusalem. The plan was accepted by the Jewish Agency, and rejected by Arab leaders. 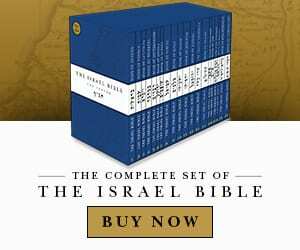 The following year, the Jewish Agency declared the independence of the State of Israel, and the subsequent 1948 Arab–Israeli War saw Israel's establishment over most of the former Mandate territory, while the West Bank and Gaza were held by neighboring Arab states. Israel has since fought several wars with Arab countries, and since the Six-Day War in 1967 held occupied territories including the West Bank, Golan Heights and the Gaza Strip (still considered occupied after the 2005 disengagement, although some legal experts dispute this claim). It extended its laws to the Golan Heights and East Jerusalem, but not the West Bank. Israel's occupation of the Palestinian territories is the world's longest military occupation in modern times.Efforts to resolve the Israeli–Palestinian conflict have not resulted in a final peace agreement. However, peace treaties between Israel and both Egypt and Jordan have been signed. In its Basic Laws, Israel defines itself as a Jewish and democratic state. The country has a liberal democracy, with a parliamentary system, proportional representation, and universal suffrage. The prime minister is head of government and the Knesset is the legislature. Israel is a developed country and an Organisation for Economic Co-operation and Development (OECD) member, with the 32nd-largest economy in the world by nominal gross domestic product (GDP) as of 2017[update]. The country benefits from a highly skilled workforce and is among the most educated countries in the world with one of the highest percentages of its citizens holding a tertiary education degree. Israel has the highest standard of living in the Middle East, and has one of the highest life expectancies in the world.